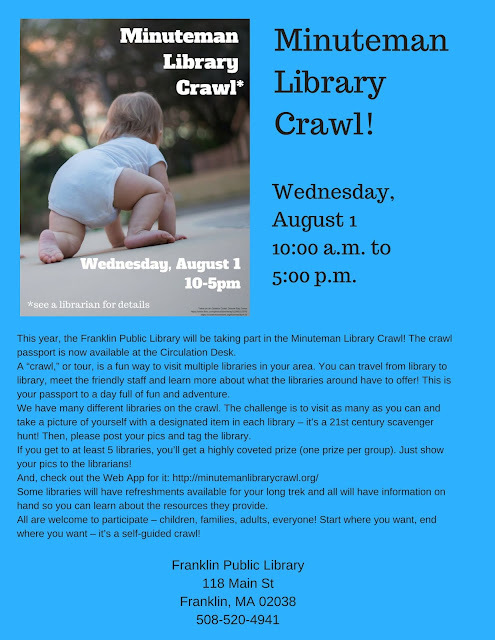 The Franklin Library is taking part in the Minuteman Library Crawl on Wednesday, Aug 1, 2018 from 10:00 AM to 5:00 PM. "A “crawl,” or tour, is a fun way to visit multiple libraries in your area. You can travel from library to library, meet the friendly staff and learn more about what the libraries around have to offer! This is your passport to a day full of fun and adventure. We have many different libraries on the crawl. The challenge is to visit as many as you can and take a picture of yourself with a designated item in each library – it’s a 21st century scavenger hunt! Then, please post your pics and tag the library. If you get to at least 5 libraries, you’ll get a highly coveted prize (one prize per group). Just show your pics to the librarians. And, check out the Web App for it: http://minutemanlibrarycrawl.org/"
What library are taking part?